At Ynyshir, Gareth Ward serves up a beef burger like no other. The chef uses minced Welsh wagyu rump cap for the mix, simply flavoured with shallot and garlic, then set and finished on the barbecue for a smoky flavour. The burger is topped with an intense bread mayonnaise, fermented iceberg lettuce and some pickled shallots and gherkins for a sublime blend of flavours. The portions here are designed to be eaten as part of a tasting menu, but feel free to go large by ramping up the quantities for this dish. Tucked away in a country house hotel in rural Wales, Gareth Ward is creating dishes like no one else in the UK. 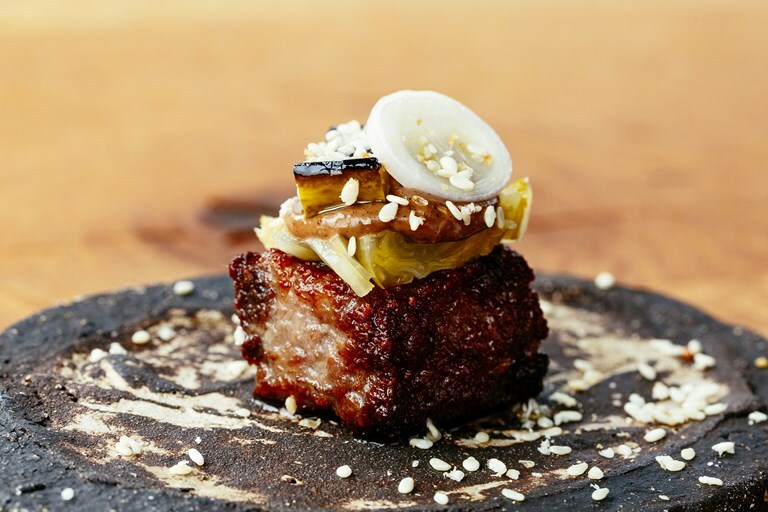 With a focus on aged meat, preserved seasonal ingredients and punchy Japanese flavours, his tasting menus are bold, exciting and an absolute must-try.